My aunts and grandmother gathered aqua mason jars from antique shops for over a year for my wedding. They found these gems in little places from South Georgia to the North Carolina mountains. We ended up using them for my rehearsal dinner and I wouldn't have it any other way. My sister and I went to the farmers market and bought $30 worth of flowers and put them together. We added mint in the arrangement for some greenery and it smelled amazing. As much as I love mint, I never thought to put it in a flower arrangement. We had 10 arrangements of different sizes and it was so affordable. 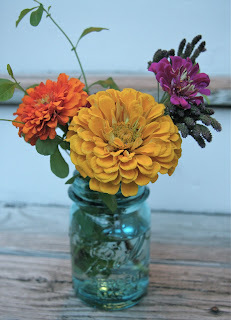 Last night I got a couple zinnias from Thackeray Farms. With so many left over mason jars I decided to recreate the arrangement. I am afraid to prune my mint back too much, otherwise I would have added some. These simple little flowers will add a ray of sunshine to the weekend. What is your favorite flower? Beautiful arrangement! Thanks for sharing with me!